Would you like fruit trees but just can’t find the space on your balcony or in your gardent? There may be a way you can have your small block and have your fruit trees too. Let me share with you the secrets of espalier. Does your garden seem to be shrinking? Just not enough space for all those fruiting trees you’d like? It’s a problem for many of us in the city. We’re often challenged by finding a free space especially in smaller city gardens. Typically we have high fences or walls, narrow spots and plenty of house but not much open space for an orchard let alone a single fruit tree with its spreading canopy. Why not try your hand at the ancient art of espalier where you can have your fruit trees in a fraction of the space? 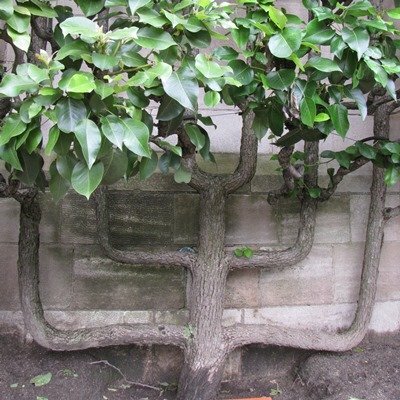 Espalier originated in Persia, where gardeners trained trees along walls or boundaries. Through the middle ages, the French became masters of espalier, and the craze for these fancy trees spread across Europe. While espalier most often involves stone and pome fruits like cherries, apples and pears, you can espalier a range of evergreens and tropical fruit trees too. Whether you live in a cool or frosty winter area or a warm frost free area, there are a range of trees to choose from. Espaliered trees can be grown in the Espalier are ideal for patios and balconies, but will need a strong, permanent support for training. A well-trained espaliered is a beautiful sight. The many traditional shapes include palmette, candelabra, serpentines and stepovers. The latter are low growing borders used around garden edges and pathways. I grew my first espalier in my 20s and have enjoyed espaliering olives, apples, apricots, and lots more fruiting varieties in the temperate and subtropical gardens I’ve owned. I find it works well even in a narrow space as the tree fruits yet only takes up a very compact area. If you wonder where to plant an espalier, I’ve seen them as tiny low step-over trees in the gardens of Versailles, bordering a pathway. I’ve had the joy of seeing memorable apples espaliered against houses in Italy and ancient espaliers in the botanic gardens and Cloisters Museum gardens in New York. Not only is it pretty, it’s practical, as espalier is ideal for fencelines, as borders and as dividing trees in a garden. Even before you train the first branch, it’s essential to get the basics right. Choose a spot with at least 5-6 hours sunlight. If planting into the ground, prepare the soil with compost and organic fertilisers such as Searles Kickalong Organic for Fruit trees, to create a fertile, moisture retentive growing medium. You’ll need a supporting framework too. At the espalier classes I show you the types and establishment of these frameworks. You will need to be vigilant during the spring and summer with training and then in winter, pruning to shape but avoiding removing fruiting buds (spurs). I’ll show you how to identify the plant parts you need to keep and the ones that musty go. You can even grow evergreens like olives and citrus as espaliers. As with any fruiting tree, espaliered trees may take a number of years to fruit. Expect citrus after just a couple of years, tropical apricots, apples and peaches may take 3 years or so. You’ll find it very easy to harvest from your espaliered fruit tree as it will be trained no higher than you can reach. Before long you’ll be enjoying the fruits of your artful tree training and friends will be asking you to help them train an espalier too. To learn espalier, come along to a class at Ecobotanica in winter each year when pruning and training begins in earnest.